Oh what a beautiful morning- oh what a beautiful day! Today has been absolutely beautiful. My companion and I were discussing how we think this was the second sunny p-day we've had since we've been in Rome. So we went and played catch and kicked around a soccer ball and then we went and did grocery shopping and it's been a pretty laid back Wednesday. I love it! This past week was, of course, great. It's amazing sometimes- we have a goal to have at least one new investigator every week. And it always seems that we get to Saturday night and still haven't found anyone who is interested in hearing about the gospel, but this past week we found two people: one on Saturday night and one who was a referral and came to church on Sunday. It's wonderful! There were two investigators in church on sunday, and then there were two investigators at a baptism for a young girl after church on Sunday, but they were actually two different investigators. The work really seems to be going well for me and my companion recently. My first transfer I think we had one new investigator for the whole 6 weeks, and now we've gotten at LEAST one every week. Some of them are investigators just because they are curious about the way members of the church live, and others really seem to want to know more about the gospel. We've had some wonderful lessons lately and we have great members who are willing to come to lessons and have lessons in their homes. Hopefully we can continue to improve and not just plateau. We found out about transfers on Monday and my companion and I will be staying here in Rome. We're really excited to be here and hope we can continue to work hard. We were talking this morning and I was telling her that- just knowing myself the way I do- telling her that I can sometimes become a bit complacent and was almost hoping a little bit that I would be transferred because I think is a way to kind of boost yourself, and I can feel myself getting a little bit more laid back than I probably should be, and I'm hoping that since we both know that this could be a problem for me that we can curb lazy tendencies before they are habitual. Sorella Bennion is so good and helps me tons- with the language, with the scriptures, everything. Life is good!!! Alrighty, well I gotta send some pictures! I hope everyone is doing well. Mom- I wish we could have you around for some of our Zone conferences. Usually Sorella Acerson just has to take care of lunch herself and we have sandwiches. They are good sandwiches, but I'm sure it would be nice for her to not have to worry about it. Love you all so so so much!!!! Me and my companion at the Colosseum. 2. met a new family referred to us from some of the elders. 2. prociutto crudo- it's like cured ham or something. Alrighty, hopefully that gives you just a little bit of insight into my life. A quick recap of the last week. 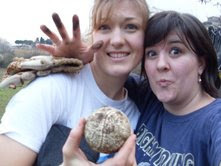 Okay- for P-day we did go play catch and we ended up finding a muddy field that had quite a bit of sheep droppings in it, but it was still pretty fun. It was really muddy though. Last week was just fantastic! We were able to meet some great people and we had wonderful appointments with some part member families and inactives and investigators. Just wonderful! Our ward is great, my companion is great, we have great leaders, and the Lord is on our side. Sorry you don't really get any more details than this, but I love you all and I'll send you some good pictures from our tour today next time! Love you all!!!!! My companion and I were waiting at the bus stop and just having a little bit of fun... recognize this pose, crystal? This is after our game of catch. It really was very fun even if it was a little messy. It's been a great week here in Italy. It's truly wonderful to see how much the Lord loves his children. We continue to work with some amazing people. Investigators, inactivies, and members. They are all wonderful and we just love them so much. I'm probably going to be pretty short today, we- my companion and I are going to go play catch. We're pretty excited about it. Most P-days are pretty hectic, and we decided to try and find someone with a baseball and gloves so we could just enjoy ourselves. We ended up borrowing some from the Acerson family as baseball is not too big here in Italy- mostly people like soccer. Lets see, since last week it's really been a pretty regular week. My companion and I are trying to be better about talking to more and more people. It's so easy to say "hi, how are you" and leave it at that, but we're getting better about continuing the conversation and getting contact information, etc. I don't know if I've told you in other emails, but the past couple of weeks I've been "translating" in primary. I really just try to get them the general idea, because that's usually all I understand, but they really understand a lot so it's not too bad. It's been a learning experience. Some of these young ragazzi (boys) are a handful and a half. Too much energy in one classroom. But the primary is pretty good sized. There were about 20 kids in there. There aren't quite as many teachers so the classes are also big and there are only two or three classes. I'm not sure why they don't have more teachers because it's actually a pretty big ward. And it is a WARD, not a branch or district or anything else. There are not a ton of wards, but we're very lucky to be in one. Alrighty, I'm going to try to answer your questions, mom. Thanks for putting them all together so I could recognize that I should answer them :). I don't say much about dinner appointments because we don't have a ton. We do eat occasionally with a few families, but the problem is that pretty much, if we want a dinner appointment with someone we have to call them and make an appoinment. It just feels awkward for me. There is one family in particular, the Duran's, who are absolutely wonderful though. They live really close to us so that's also very convenient. They feed us pretty often and have two daughters. They are from Bolivia, I believe, so the food usually has a little bit of a south american flair, but it is absolutely delicious, and the sister won't tell us her secrets. We try to bribe the daughters into telling us her secrets, but they are pretty loyal to their mom. Sorella Bennion and I are going to make dinner for them next week because they have us over so much as a way to hopefully say thanks. But other than that it really just depends on who we are with. If we are eating with an american family they usually try to give us stuff that we can't usually get because they can buy it at the base that is in Napoli or at the commisary here in Roma. So we can usually get most things we might want... like cheddar cheese... if we go eat with the american members. I don't eat as much pasta as I thought I would when I got here, but Sorella Bennion says she's had much more in other areas, so I don't know. If we eat out we get pizza. That's pretty much your only option for fast food around here. It's pretty different because you just buy how much pizza you want and then they heat it up for you. It's really yummy. We do have a favorite pizza place and we go there about once a week. The owner, Duvis, is so so nice and we're working on teaching her the lessons. There are McDonalds here, but I just can't quite get a cono when there's real italian Gelato right down the street. The gelato is amazing. Unfortunately for my mouth, and fortunately for my waistline, most of the Gelateria's have closed for the winter. I was kind of mentioning it before but there are several hundred people in the ward. In sacrament there are probably usually around two hundred, but of course there are the inactive people. Transfers are every 6 weeks. We are actually in week 4 of this transfer so we'll see if I'll be hanging around here for another 6 months. Transfer calls are a week from monday. Laundry. We have a small washing machine at our house. In the bathroom actually. So we wash our clothes there and then just hang them up on drying racks. Apparently its a little backward from how it is at home where the humidity is in the summer, but here it is the most humid in the winter. So in order to dry your clothes here, you pretty much have to dry them inside because it just rains too much and is too cold and humid for them to dry outside. But it is so nice to be able to do our laundry in our house. I think that was all of your questions. Let me know if you have anymore. On a different note, one of the elders and I will be singing in church this sunday. ***see below*** I think we'll be singing in English so that could be kind of different for the ward, but they NEVER have special musical numbers so hopefully they will appreciate it. I think we're singing a really really nice arrangement of I know that Me Redeemer Lives. Oh, and I think i've heard the song you mentioned "All that I love is Home" I do remember liking it. I know there's one line in there that says something like "... a place to belong, people who miss me whenever I'm gone..." It's nice to be missed and know that I miss and love you too. But I am so thankful to be here and to be having these wonderful experiences, and meeting and loving such wonderful people. I love you all and hope you have a wonderful week!! This was a pretty sunset from one the bus stop. This is my district. We had DDM at the Pearsons and had lunch afterwards. It's homemade sushi. It was super yummy and fun! This is pretty close to downtown rome. This is a little bit nicer area, but pretty typical. "I Know that My Redeemer Lives" Sara and one of the Elders singing their special musical number. Well, I really hope things will get to normal here. I was thinking the other day trying to figure out if we’ve had a “normal” week here between zone conferences, holidays, permesso (legal permission to stay in Italy) appointments, transfers, and the other random things that pop up. And I couldn’t come up with one. But, I think we’ll start getting into a little bit slower time of year. I can’t believe how fast the time is flying. There’s a small part of me that’s glad that time goes fast because it means that we’re busy and that we’re working. But I don’t want it to go too fast or too slow… it just needs to keep moving at a normal inbetween pace. I guess that’s a big request, huh? Oh well, I’ll just take it as it comes. New years here was a little bit crazy. I’ve never tried to sleep through the fireworks before, and with people living in such close proximity to each other I wasn’t able to sleep from about 11:30 to 12:30 because it sounded like the fireworks were going off right outside our door. And I’ve noticed here that they aren’t so much into the pretty sparkles or whistling fireworks… they want them loud. So they pretty much just sound like bombs. They set them off during the day too. Its kind of fun as long as you’re not trying to sleep and don’t mind feeling like you’re in a war zone =) On new years day we cleaned our apartment. We didn’t get to the mold, we’re actually hoping to get a little bit of help with that since it is such an involved process. But it was an alright day. It was kind of nice to be able to stay inside and clean because it was cold and rainy. It’s cold and rainy a lot, we just don’t usually have the option not to go outside. We’re getting better about opening our mouths and have had some great discussions with people on the bus and doing house (tracting). We established yesterday that just going out and trying to find people on the street is not terribly effective here in this area. It is a great tool when we have zone singing because it kind of filters out the people who are in a big hurry and have absolutely no interest from the ones who have time and interest enough to stop and listen. With zone singing street contacting is great, but with just me and my companion it didn’t work very well. One kind of funny story from this week was that my companion had an Egyptian stalker. Apparently he’s in love with her- or at least that’s what he said on the phone, and just to make sure she understood he told her in more than one language. Because we figured out what number he was calling from he started using a different phone and tried calling from three different numbers 13 times. We had the elders answer our phone a couple of times- our stalker friend would just hang up- but thankfully he has stopped calling. Apparently he wasn’t as in love as he thought he was. It’s a darn shame though that this had to happen, because he worked at a fruit stand that we really liked to go to because it was cheap and the fruit is really really good. And doggoneit now we can’t go there anymore. Oh well… there are lots of fruit stands, we’ll just have to find another. We got a little frustrated last week because we had lots of appointments that people chose not to join us for, but this week has been better. We had one appointment with our VERY VERY catholic friend and she was able to feel the spirit- it was great. I think she’s gaining some pretty significant interest in the book of Mormon. One step at a time. The book of Mormon truly is amazing. It’s such a great tool as it is the proof that Joseph Smith was called of God to restore his gospel. I’m so thankful that I can be here and talk with people about the gospel. There are a lot of ups and downs emotionally, but the ups definitely compensate for the downs and then some. Mom and dad I hope you're both feeling better. It sounds like you are getting older... that's not supposed to happen!I love you all and hope you have a fantastic new year!! Some people in Italy like things a little on the wild side. This is a christmas tree stuck inside another tree and completely covered with lights and other junk. Fun stuff! This is a view of Piazza del Popolo. We sing near here for zone singing. The dome in the distance is the vatican or St. Peter's basicilla. Very pretty! Hello Hello Hello and Happy New Year!!! Well, It hasn't even been a whole week since I've talked with you and I'm still just hanging in there. One new thing is that my companion and I did develop colds so that has been fun for the past few days, but I think it's already heading out- thank goodness! I keep having random thoughts pop into my head and then forgetting what I was going to write. Sorry…Oh yeah. Tomorrow. Tomorrow I think I might have told you, but we have Festa di Lavora tomorrow. Literally translated that is Party of Work. We get to seriously deep clean our apartments. It will be good, but I'm just not sure if we're going to be able to eliminate all of the mold in one day because I think it involves a several step process- spraying with bleach, letting it dry, scrubbing it off, spraying with anti-mold spray, letting it dry, and then painting. I think the Elders are going to help us with the mold part- which would be so so nice. I got a lot of cards and another package the other day from several ward members and Cyndi Taylor. It's like Christmas is just still coming. I still haven't gotten the one from Tish, but I'm looking forward to it. There's actually another holiday here called Labè Fanna on the 6th of July to celebrate when the wise men gave gifts to the Baby Gesù and so they give even more gifts then. So, maybe that package will show up in time for that. Sorella Bennions package still hasn't come either, so hopefully she can have her Christmas soon. So we didn't realize that the Day after Christmas was also a holiday here. There is a Philipino lady here, I think I might have mentioned her (Teressa), but we took her some brownies the other day and she was just so so so excited and was practically begging us to teach her how to make them. Of course we were very happy to do so, but she didn't know what kind of cocoa to use so we told her we would bring some. Well we try to go to the store the day after Christmas on our way to her house and NOTHING was open. NOTHING!!! There were more people out and around on Christmas day than there were the day after. The busses were still on a holiday schedule and everything. It was pretty weird. Apparently there's a saint who did something the day after Christmas??? I'm really not too sure. Things are still pretty decorated and I'm glad to see the holiday season sticking around a little longer, but it really feels weird. I've been in a bit of a routine for the past 23 years of my life and now things are like they've never been before so it just doesn't quite feel like I've actually had Christmas or that New Years is really tonight. But I guess it really is, right? Oh, we did have a rather… interesting experience the other day. We have a potential investigator who is ridiculously nice and we just love her to death. Anyhow, she's a little misguided in some of her beliefs, but of course, we're hoping to change that =) She invited us to go with her to this church in Centro- or downtown which is actually out of our area so we got permission from president and went. Well, this church was actually called something to the effect of the church of Mary of Miracles. And I had no idea but there are people who believe that Mary appears every 10 years and that on the 27th of every month they pray to Mary and thank her for everything she does for everyone. And I'm not sure if it's just the 27th of December, or if the 27th of every month you can pray for whatever you want and Mary will give it to you. It was very very strange. As my companion said after we left- she said "We were just in the heart of apostacy." It's so sad to me how far away these people have gotten from the teachings of the Savior. Seeing how lost people are makes me more and more thankful to have the gospel in my life. To have the truth and know that we are led by a living prophet today. One who won't let us stray from the teachings of the Savior because the Savior is the Head of the Church. How thankful I am for my Savior, Jesus Christ. For His atoning sacrifice so that we may have hope and that we may one day return to live with our eternal Father in Heaven. Sorry, I don't have any pictures from Christmas day because I forgot to bring my camera with me. :( But these are from when we went to Centro with Simoa- our potential investigator. This is the Spanish Steps. (Crystal- in Roman Holiday this is where she's eating her gelato, and the fountain I'm standing by is the one the kids are playing in and he tries to borrow a little girls camera.) Cool, huh? This is me at Trevi Fountain. I've been told it's the largest fountain in the world. It is quite large. I don't know how well you can tell from this picture, but there were just people EVERYWHERE!!! It was packed packed packed! I believe this was the 27th and people were out shopping and just wandering. It was fun and a bit crazy. This is looking down the street away from the spanish steps.